Tina Girouard was born in 1946 in Louisiana and migrated to New York to join the contemporary art movements of the late 60's and the 70's. She shared her studio in Chinatown with musicians Richard Landry and the Philip Glass Ensemble for a decade. She was an early founding participant of 112 Greene St., FOOD, the Clocktower and PS1, Creative Time, Performance Art and the Fabric Workshop. 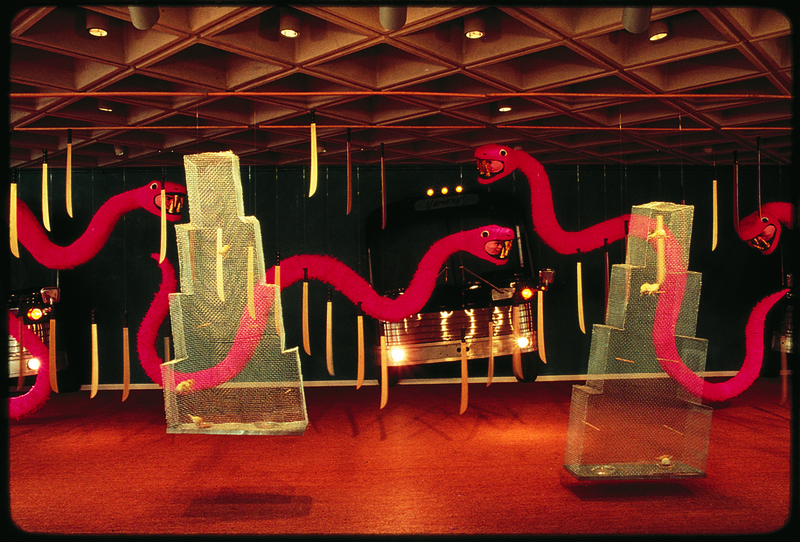 In addition to her own projects she was involved in films, videos and performances by Keith Sonnier, Richard Serra, Lawrence Weiner, Laurie Anderson and the Natural History of the American Dancer, among others. She collaborated with Sonnier, Deborah Hay and on many efforts with Gordon Matta Clark. I mention her associates because she is not well known, except to them. In 1979, after a massive fire destroyed her building, she moved to a small space across the street from the World Trade Center and moved her main studio to Louisiana. There she traveled for projects and shared her experience, helping to promote Louisiana's culture by creating visual arts venues and an international festival that brings Francophone music, dance, theatre, visual and culinary arts from Europe, Africa, the Americas, Asia and the Caribbean, wherever French is spoken. Since 1990, she has maintained a studio in Port-au-Prince, Haiti where again she devoted herself to work beyond her art by writing the first book to recognize the Sequin Artists of Haiti. Most important to Tina is that her projects saved lives by giving Haitian artists respect in their own country and by bringing them and their art, performing and visual, to the United States. I can speak of this because I was with her in Port-au-Prince in 1994, when bullets were zinging and fists flew in our direction at carnival street performances Tina presented, called "Rara St. Isidor." I had traveled to Haiti to curate an exhibition of her work, the traditional Voodoo Flags of Antoine Oleyant and their contemporary collaborations. 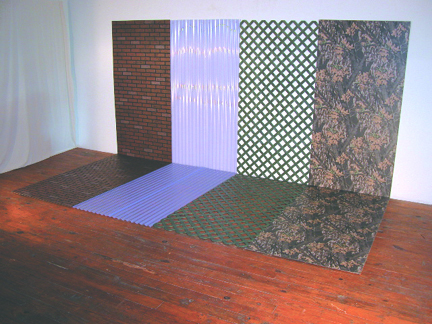 "Under a Spell" traveled widely and ended in 2002, at the Bronx River Arts Center. Girouard is a distinguished multi-disciplinary artist recognized for installation works, performances, video/film and static works made of non-traditional media such as wallpaper, linoleum, fabric, stamped steel and sequins as well as paint on canvas. Her latest works combine both media and discipline. Girouard's career has been largely outside the gallery system owing to a preference for non-profit organizations and exhibition venues with broader public audiences and community involvement. She has received numerous fellowships and grants for projects. Her works are in some important museum and private collections but especially in artists' collections. Among the high points of Girouard's exhibition history were invitations to international events such as Documenta 6 in Germany, the Venice Biennial, Paris Biennial and in 1983, a mid-career retrospective mounted at the Rufino Tamayo Museum in Mexico City. Albert Raurell, the Museum’s Director, opened the exhibition catalogue with this remark, "Tina Girouard es una artista para los artistas, como se podria afirmar en el caso de Marcel Duchamp." Born in Buffalo, New York, in 1945, Susan Rothenberg had her first solo exhibition at 112 Greene Street Gallery, New York in 1975 and became renowned for "The Horse Paintings" which highlighted her passionate relationship and ongoing struggle with the medium of painting. Since then she has had close to 50 solo exhibitions nationally and internationally, and numerous group shows. In 1992 a retrospective of her work opened at the Albright Knox Gallery in Buffalo, New York before traveling to Washington D.C., St Louis, Chicago, Seattle and Texas. In 1996 the Museo de Arts Contemporáneo in Mexico hosted a second retrospective of her work. Rothenberg has been the recipient of numerous awards, including a National Endowment for the Arts Fellowship Grant (1979) and most recently, the Rolf Schock Prize, Stockholm (2003). Her paintings, drawings, prints & sculptures have been the subject of art criticism over the past 3 decades, and her works are included in every major museum of art around the world. Susan Rothenberg moved from New York City to New Mexico where she currently lives with her husband, Bruce Nauman. Thank You to Susan Rothenberg and other friends who stayed in touch and remained interested in my work as I wandered away from the art world over the past twenty years to the Louisiana swamps and Vodou societies in Haiti. Thank You to the CUE Art Foundation for hosting an exhibition that I hope will open doors. The show is composed of one or two works selected from each of the past three decades and current work. I also want to thank David Bradshaw, the Johnsons and Fredericks for helping with preparations. Thank You to Always Hungry, a tiny featherless baby bird I found at noon on hot asphalt and nurtured back to life. After feeding furiously at the kitchen sink one day, she flew out the window, disappearing with fellow mockingbirds that appeared out of nowhere. Surprise, against her nature she returns from time to time. Ignoring the banging screen door and three big barking dogs, she brings her offspring to the back porch and teachs them to bathe in the dog dishes and hunt bugs in the fallen pecan branches. Once she even followed my van as I did errands. Always Hungry graces my life with her wildness. Thank You to my mother, Yvelle Theriot Girouard, this exhibition is dedicated to her. At 96, she lives alone checking her e-mail, cooking gumbos, ettouffees and fricassees while showing me the way to a long and fruitful future. Having been told by James Drake about The CUE Art Foundation, and then being invited to choose an artist who has been unaffiliated with a New York gallery, it was no big leap to think of Tina Girouard. We have been friends, dancing and cooking pals since 1969. The first home-cooked meal I had in New York was at Tina’s famous Chatham Sq. kitchen, along with her friends Mary Heilman, Gordon Matta Clark, Dickie Landry, Jackie Windsor, Keith and Barry Sonnier, Alan Saret and others, all of who came to eat, discuss, collaborate and share. As for her work, mostly performance in the early years, the painterly and sculptural installations were animated by a passion for objects. Eventually this gave way to image making. She painted a litany of objects and signs in a freshly imagined pop art vein. This work, plus by virtue of her association with Haiti’s Voodoo artists, led to an elevation of her iconography to a remarkable integration of cultures. More recently she arrived at the place most artists do: alone in the studio. The new works echo back to her early use of common household materials and combine her ongoing fascination with symbolism. With pleasure I introduce the work of Tina Girouard.